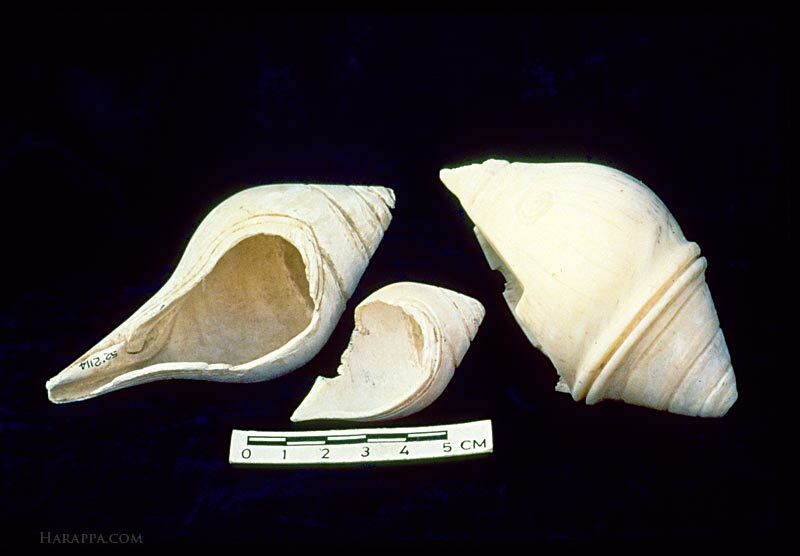 Libation vessels made of the conch shell Turbinella pyrum. One of these is decorated with vermilion filled incised lines. A single spiraling design is carved around the apex and a double incised line frames the edge of the orifice. This type of vessel was used in later times for ritual libations and for administering sacred water or medicine to patients. Dimensions of the left vessel: 11.4 cm length, 5.4 cm width, 4.7 cm height. Kenoyer 1983: 183-4, fig. 3-15, 5.